The catalogue number 'LPH 001' demonstrates as well as anything that this disc is the start of a new venture. In fact, the corporate reorganisation that has gone into the new label PHI is quite difficult to untangle. The label is nominally a personal project on the part of Philippe Herreweghe, but the credits on the back of the box make clear that it is actually produced by Outhere, the French production company also responsible for other quality imprints like Ricecar and Zig Zag Territoires. Then there is the relationship with Harmonia Mundi to consider. Herreweghe was formerly one of the biggest names on their roster, but the founding of this label suggests that long-running and fruitful relationship may be coming to an end. Thankfully, HM will be distributing all future PHI releases, so with any luck Herreweghe fans will be able to enjoy the best of both worlds. Thankfully too, Herreweghe seems intent on picking up pretty much exactly where he left off from his recent HM recordings, stretching the period performance ethic into the later Romantic repertoire. And if your first reaction to the news of yet another Mahler 4 was that it marks the start of yet another year of Mahler excess from the record companies, then think again. This recording is something genuinely new. 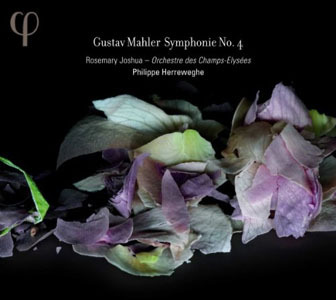 For a start, it is (at least to my knowledge) the first ever recording of Mahler 4 on period instruments. The nearest thing to a precedent is Norrington's recording with the SWR Stuttgart Orchestra, which uses modern instruments but eschews vibrato. Of course, Norrington and Herreweghe are very different artists, and I think it is fair to say that Herreweghe makes the work his own. If you've heard his recordings of Bruckner's 7th Symphony and the E minor mass, you'll know what to expect. As with those recordings, Herreweghe manages to both strip back the textures to a core of clarity, but also retain the melodic impulse and sheer sumptuousness of the music. How on earth does he manage to square that circle? Well, top quality orchestral playing is part of the answer. The Orchestre des Champs-Elysées continues to challenge Anglo-Saxon prejudices about the poor quality of French orchestral playing with yet another top drawer performance. The strings demonstrate that they have no need for vibrato to keep their ensemble together. There is no dryness to the string sound either, it is buoyant and lyrical throughout. The brass (horns and trumpets only in this symphony) can occasionally be a little nasal, but the fact that the more penetrating textures are reserved for the solos, while the ensemble work, especially from the lower horns, is imbued with a warm roundness, demonstrates that all these timbral distinctions are entirely deliberate. The audio quality is also first rate, which in combination with the quality of the orchestral playing brings out many details that usually go unheard. The orchestra may be the smallest that Mahler ever used for a symphony, but as this recording demonstrates, there are plenty of unusual instrumental cominations, particularly in the lower woodwind. The contra-bassoon in particular comes across with a real clarity, and those ensemble passages where the bassoons interact with the bass clarinet and cor anglais come to life in a way you will rarely hear on other recordings. Herreweghe's tempos sometimes seem strict, and sometimes a shade fast too, but the sheer coherency of the interpretation more than justifies all of these decisions of detail. It isn't a Romantic reading as such, but then neither is it anti-Romantic. In the third movement, Herreweghe's discipline acts as something of a corrective to the trend of other conductors to treat the movement as a full-blown adagio. By retaining the dance-like lilt of the movement, Herreweghe manages to add a sense of propulsion to each of the phrases, and without actually playing the movement any faster than we are used to. Rosemary Joshua stands apart from the orchestra in many ways in her fourth movement solo. She has more vibrato than any of the players, still not a huge wobble but it stands out in this context. Mahler warns the conductor in a note at the start of the last movement to make sure that the orchestra never drowns out the singer. Herreweghe is able to rely on the top quality audio to illuminate the inner orchestral textures without having any of the players come close to singer's dynamic. This performance of the finale comes as close as any to reconciling the many paradoxes of the work. By retaining the inner complexity of the orchestral accompaniment, Herreweghe is able to treat the movement as both a song setting and a symphonic finale. Then there is the vexed issue of the relationship between innocence and experience – how to express a child's vision of heaven in this most adult of contexts and with an adult operatic singer. Rosemary Joshua sensibly avoids the overtly naïve approach, she never tries to sound like a boy treble for example. But she sings the words with the utmost clarity, and lets them speak for themselves. Herreweghe too, seems to be avoiding excessive interpretation in this movement, as if the music itself was able to tell its own story without any excess baggage from the podium. Herreweghe has created something genuinely new from a loved classic, and yet hasn't added a single thing in his interpretation. Mahler year number two just got off to a very good start.